Note: You can enter this giveaway three (3) times per e-mail address per day. Deadline is 11:59PM ET 5.24.18. This is the toaster Goldilocks loves because her toast, and bagels, and pastries always come out just right. 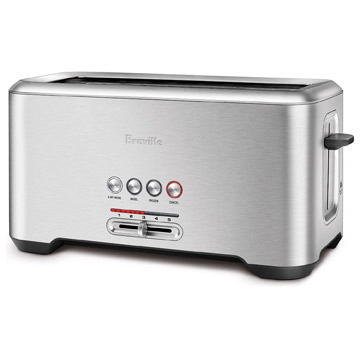 This Breville toaster’s performance goes beyond what you’re used to. The A-Bit-More button lets you lower your bread to add a little extra time so it always comes out perfectly. The bagel button activates additional heat toward the center of the bagel to only toast the inside. There are defrost and cancel buttons, and the slots are long enough to fit homemade or artisan bread slices. So go ahead and toast that piece of Ciabatta. Just remember, we warned you that Goldilocks and other guests may come to visit and not want to leave after using this toaster. NO PURCHASE NECESSARY TO ENTER OR WIN. Void where prohibited by law. Open to legal residents of the 50 U.S., D.C. and Canada (excluding Quebec) who are at least eighteen years old at the time of entry and have internet access. Begins on 3.28.18 at 12:00:00 a.m. ET and ends on 5.24.18 at 11:59:59 p.m. ET. To enter the giveaway, submit your full name and email address on this form. Odds of winning this giveaway depend on the total number of eligible entries received. Only three (3) entries per email address per day. Sponsored by Leite’s Culinaria, Inc. For more information, visit our Official Rules. For a list of winners, check out our Very Happy Winners page. Be sure to add giveaways@leitesculinaria.com to ensure notification if you are the winner.